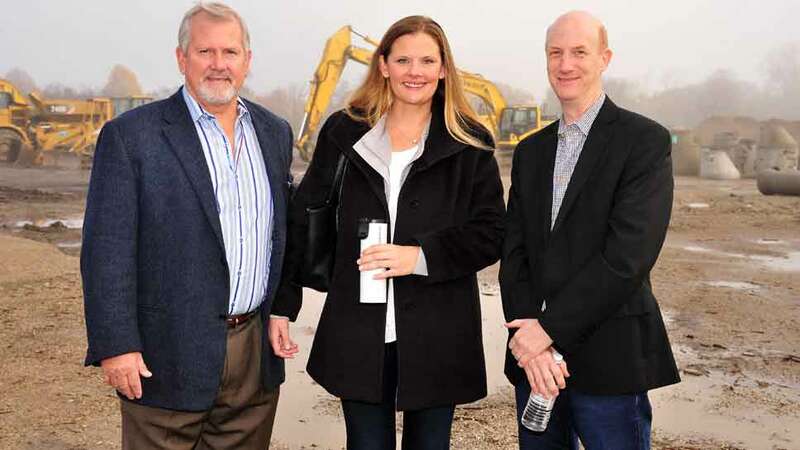 LAKE FOREST — Lake Forest officials and representatives of the real estate and development communities broke ground November 3 on Kelmscott Park, which will add a mix of 165 new housing opportunities at the northwest corner of Laurel and Western Avenues. The project will put 12 single family homes, 42 condominiums and 111 rental apartments on the 10.5-acre site which once housed Lake Forest’s municipal services building, according to Tim Anderson, the CEO and owner of Focus Development, the project’s developer. The seeds for the project were planted more than three years ago when the city asked developers to submit requests for proposal for the property. Focus competed with 11 other developers for the opportunity, according to Mayor Donald Schoenheider. He said Lake Forest had some specific goals. 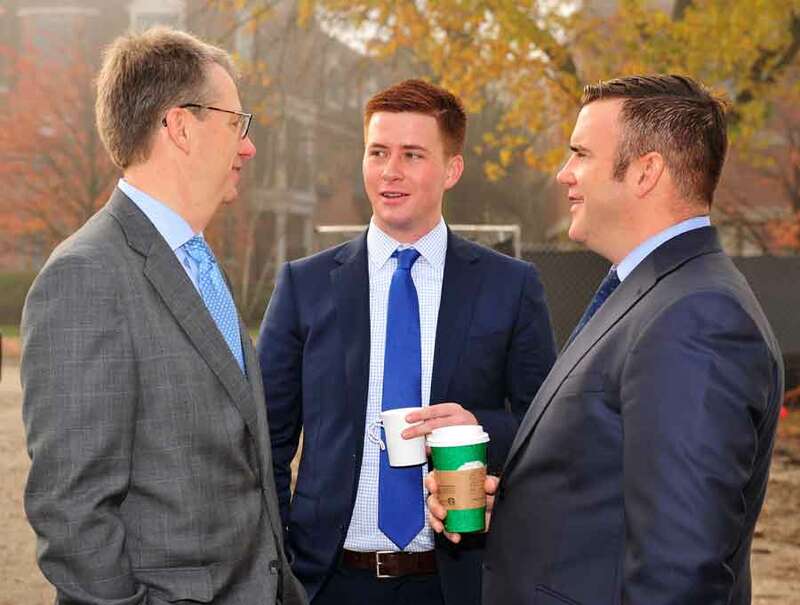 Anderson said the opportunity to develop a 10-acre site bordering a vibrant suburban downtown was a unique opportunity his company could not pass up. He knew what he needed to do based on the city’s requirements. While the condominiums and apartments will be ready for occupancy in spring or summer of 2018, Christine Kolb, Focus’ associate vice president for development, said the single-family homes will be built as they are sold. The single-family homes will start at $1.485 million with three bedrooms and 3½ baths, according to Amy Corr, the managing broker of the Lake Forest @properties office. She said @properties will handle sales of the homes and condominiums. Though the homes’ exteriors are prescribed, Corr said the interior is an open canvass for the buyer, with two basic formats. One model is very open while the other is more traditional. Both have first floor master bedrooms. The condos will offer a greater range of price points and sizes, according to Corr. The cost will range from $645,000 to $1.675 million. The smallest unit will be 1,528 square feet with two bedrooms and 2½ bathrooms selling for $645,000. The largest has four bedrooms and 3½ baths along with an office. It is 3,799 square feet selling for $1.675 million. Kolb said the rental apartments range in size from 750 to 1,800 square feet spread over one-, two- and three-bedroom units. They will cost from $1,800 to $4,200. The RFP also required affordable housing stock, according to Schoenheider. Kolb said those units will rent from $900 to $1,200 a month. One of the requirements of the RFP was the preservation of the heritage oak tree on the property. It is fenced off during construction to ensure nothing happens to what has become a symbol of Lake Forest for many. Though the tree is not the model on the Lake Forest’s logo, City Manager Robert Kiely, Jr., said many people in town revere the tree. 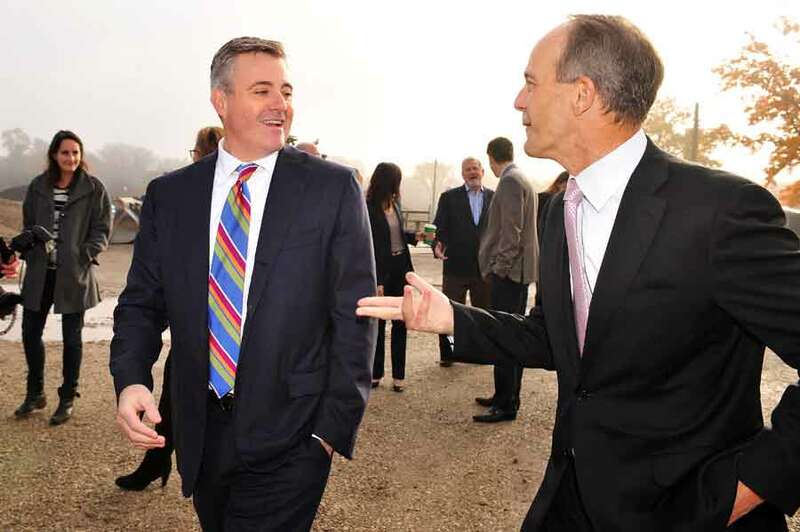 Mike Golden (left), owner of @properties, and Tim Anderson, of Focus Development, enjoy conversation at the Kelmscott Park groundbreaking ceremony November 3 in Lake Forest. 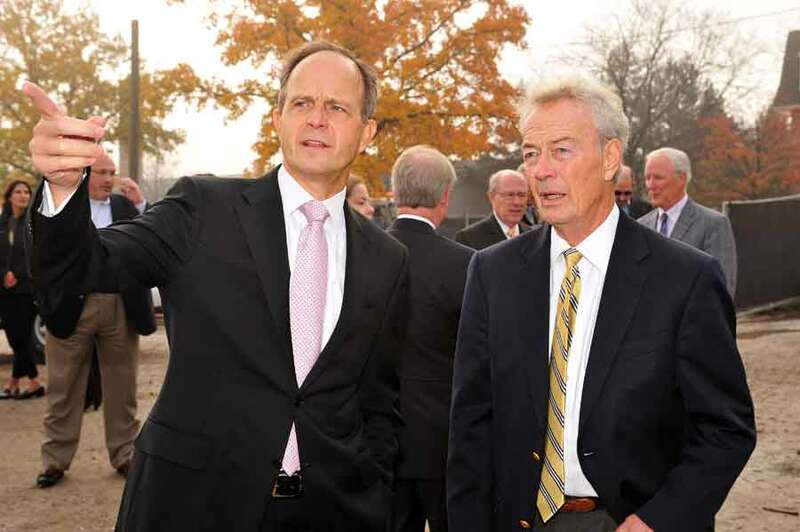 Tim Anderson (left), CEO of Focus Development, talks with Jack Reisenberg, third ward alderman, Lake Forest, Thursday morning on the Kelmscott Park residential property construction site in Lake Forest. 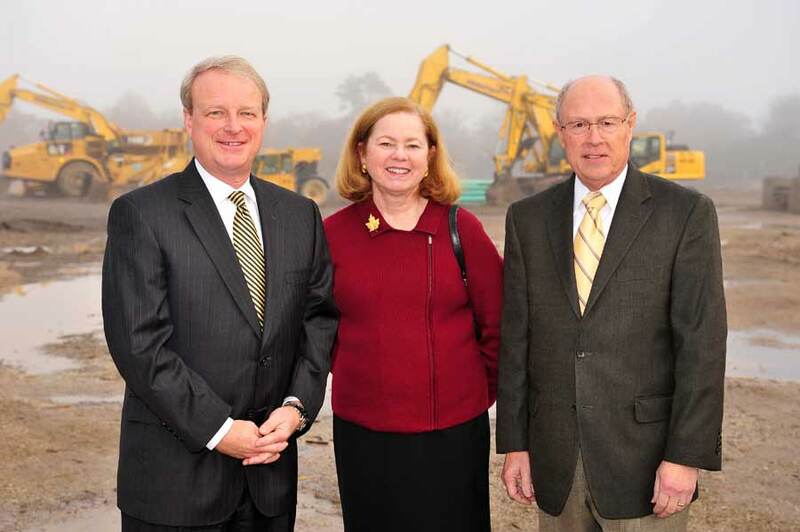 From left, Orren Pickell, CEO, Lisa Pickell, COO, and John Forehand, chief architect, all of Orren Pickell Building Group, talk at the Kelmscott Park residential property groundbreaking event, THursday morning in Lake Forest. 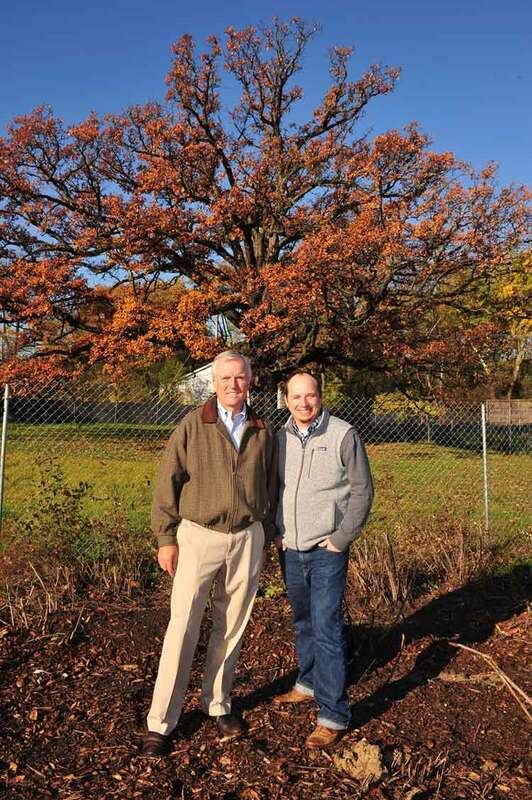 Fred Wacker (left), president, Mariani Landscape, and Seth Dreier, project architect, Mariani Landscape, stand in front of the 130-year-old white oak which has been required to remain on the Kelmscott Park residential community property, Thursday morning in Lake Forest. 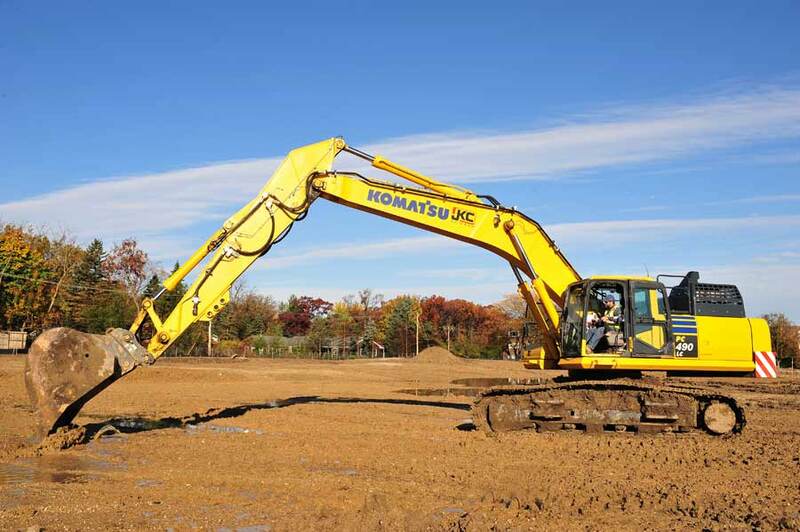 Mike Clark, operating engineer, John Keno and Company Inc., breaks ground on the Kelmscott Park property, Thursday morning in Lake Forest. 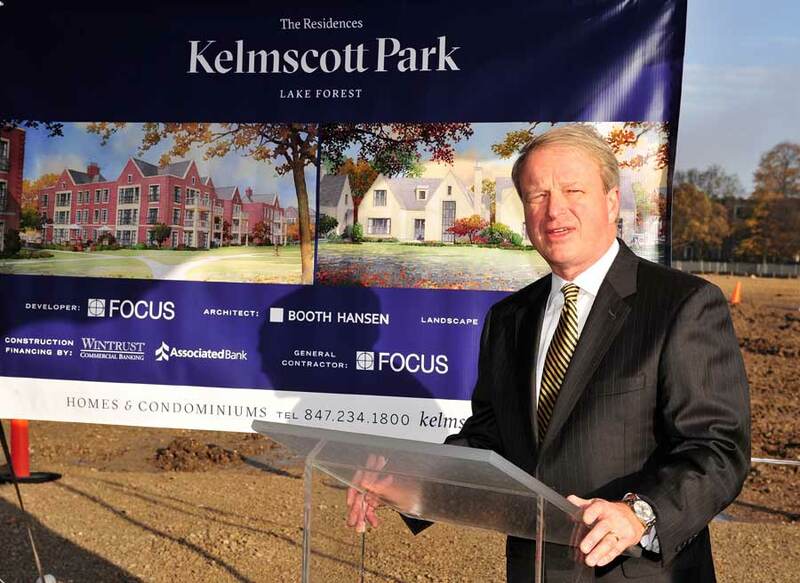 Lake Forest Mayor Donald Schoenheider greets attendees at the Kelmscott Park residential property groundbreaking ceremony, Thursday morning in Lake Forest.